You'll be blown away with the unique design of this concrete wall seating! Aside from the home interior, homeowners also make sure that their outdoor spaces look beautiful and well-designed because this is also a favorite spot for relaxing and bonding with family and friends. One way to do that is to add an outdoor structure like a pavilion or a gazebo. For a simpler approach, one can just add a small seating area or an outdoor dining area where you can read a book, eat meals or just relax. But for other spaces, they prefer to add sculptural items and even turn some features into something sculptural like the fence or even the bench. 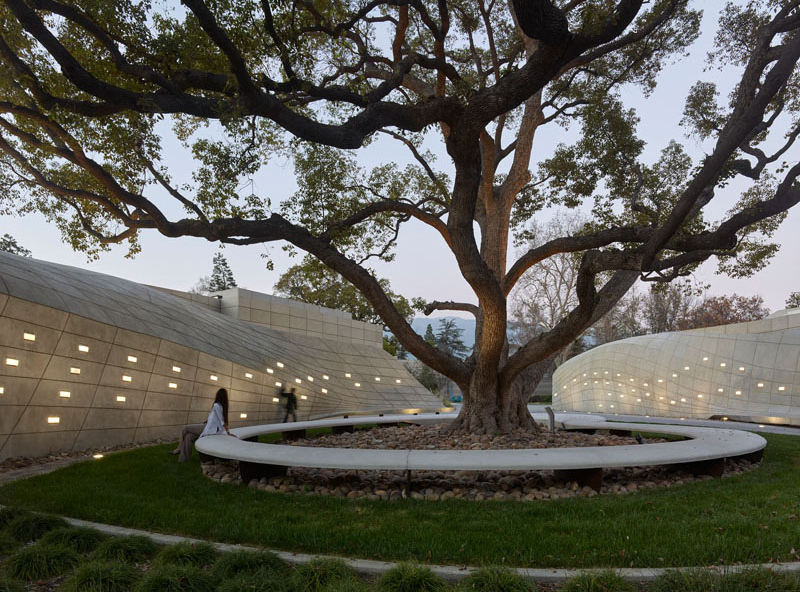 This is the case of the outdoor space of the Kaplan Family Pavilion at the City of Hope in Duarte, California. The building itself received an LEED Platinum but aside from the architectural design of the house, the outdoor seating is pretty impressive. 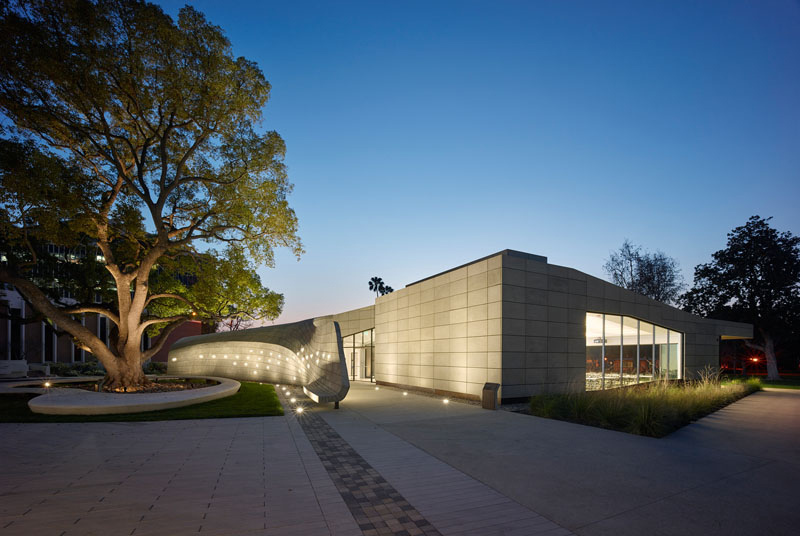 The Pavilion is a multi-use space which had an additional 7,000 square feet of new space for exhibits, events, administrative offices, and storage. 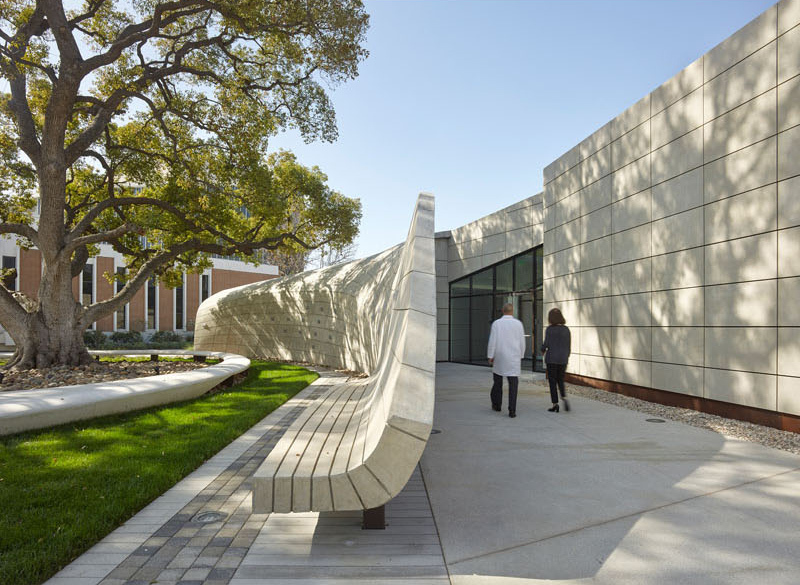 It uses the landscape to shape the built form and vice versa. 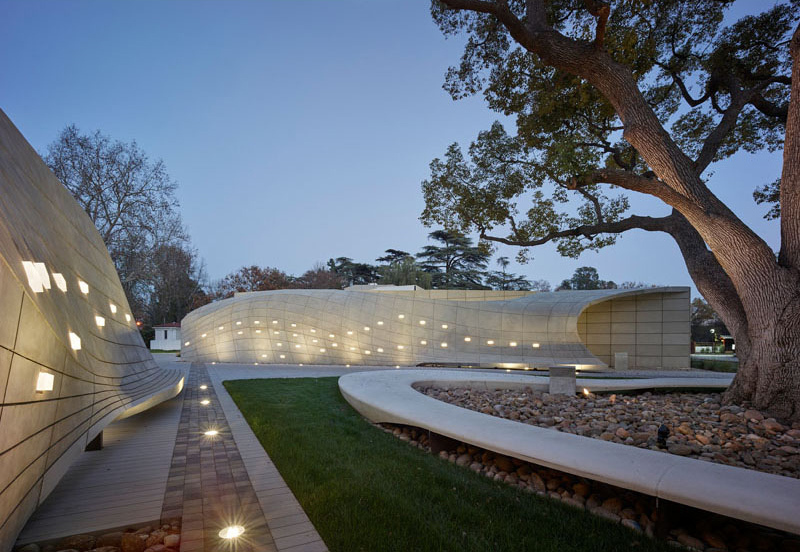 Outdoors, two billowing, sinuous concrete walls were built to protect the entrances to either side of the Pavilion while subtly genuflecting and twisting to create seating to face an irregular, oblong bench around the tree. Said walls have 75 backlit LED plaques along its surface of both concrete walls. If you look at it closely, you can see how beautiful and unique it is. Take a look at the concrete wall seating below. Unique feature: If you think your bench is cool, you will surely look at it differently now after you see this amazing concrete wall seating. 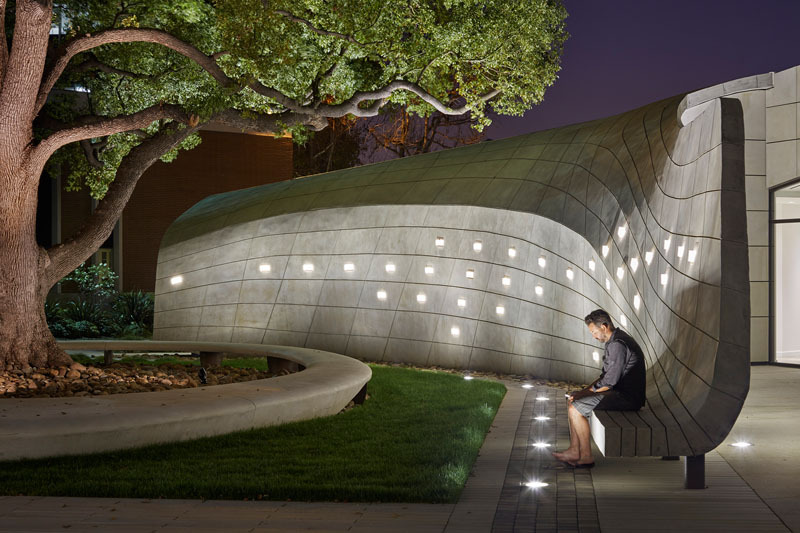 At first glance, you will immediately be impressed with the design of this outdoor seating because apparently, it is connected to the concrete wall. But it isn’t just that area that is very nice but the entire City of Hope. You can see different shapes around the area as well as modern landscaping which makes it appear really stunning. It would indeed be nice to spend some time in this space. Just look at the beautiful lights all around the area! Such a total stunner, right? 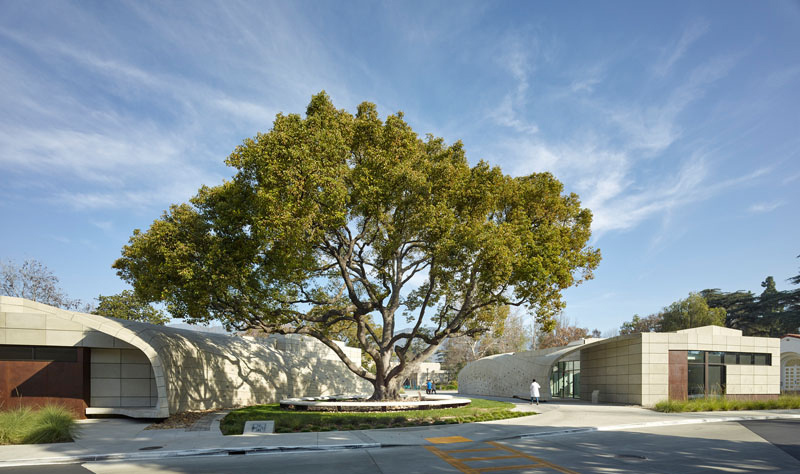 And it is also a good idea to surround a huge tree with concrete seating. During the day, this is what you can see. Isn’t it a nice place to just relax? Well, if you are in the area for some serious business, you can take a rest here. The lights used in the concrete walls add an interesting appeal to the home just like what you can see here. And aside from the concrete wall seating, one can also seat around the huge tree since there are concrete benches around it too. You can see here the concrete bench. Aside from that, notice the neat landscaping too and how lights were added not just in the walls but even on the pathways. It really looks interesting, right? Aside from the design, it does look challenging to make but it appears sturdy despite all those curves. 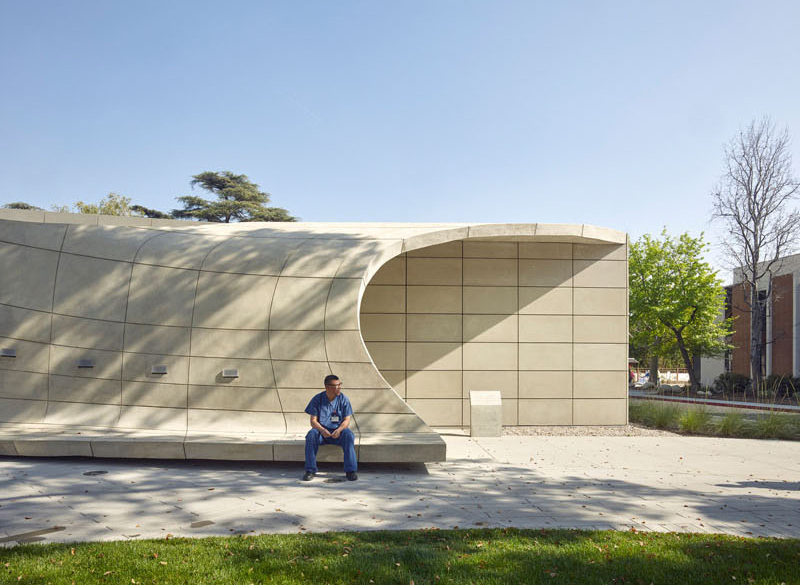 One last look at the curvy concrete bench that connects to the wall. This is indeed a brilliant design idea! 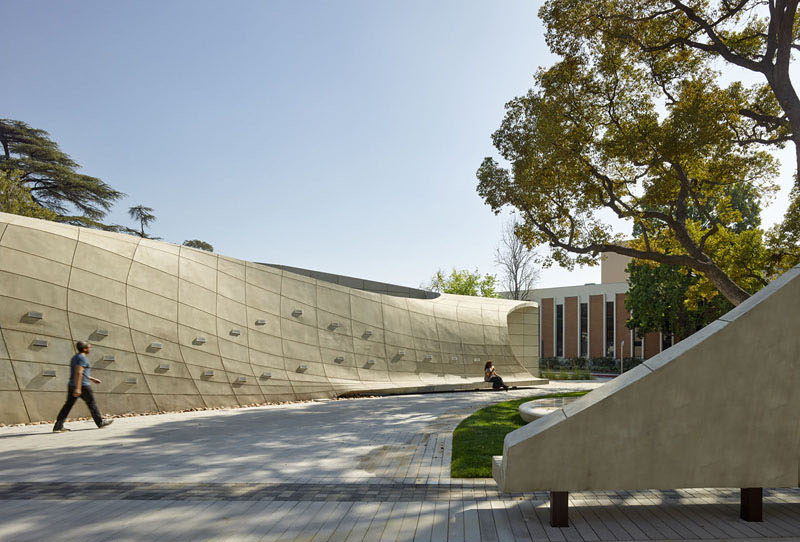 This design from the Belzberg Architects has drawn worldwide attention. Many tourists also come to visit the place to check the concrete wall seating in its outdoor area. Aside from that, there are also wishing trees in the space. So, when one is there, it is like they are actually visiting not just one but many other interesting spots because the City of Hope is already a nice tourist attraction. 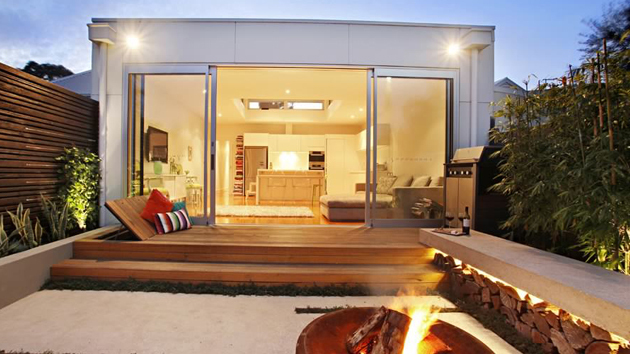 What can you say about this outdoor seating?